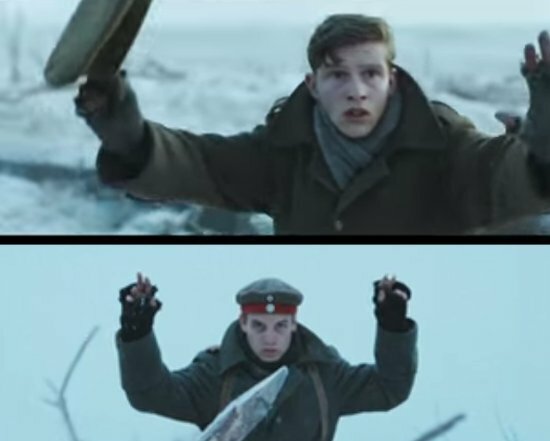 Four years ago, Sainsbury's, a chain of supermarkets here in the United Kingdom, released their Christmas advertisement on national television. 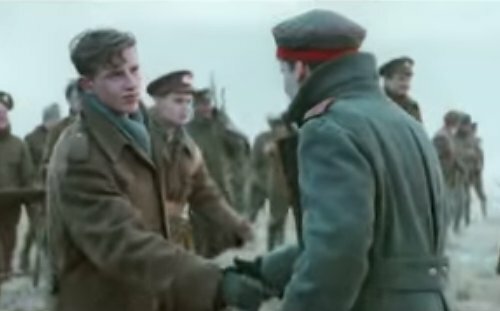 They made a powerful three-minute video of the Christmas Truce of the First World War that was being fought one hundred years ago. I don't remember ever having heard of this. But in the one of the most brutal wars in all of history, there were unauthorized spontaneous ceasefires along some areas of the trenches. Some of the soldiers from opposing sides exchanged Christmas greetings and even sang hymns together. Jesus, the Prince of Peace, came to give us peace with God through His atoning blood, and eternal life. The recognition of this wonderful fact by both sides was enough to stop the aggression for at least a few hours. But then the overriding influence of the "powers that were" obliged them to continue on their senseless course. The current of this world swept away those moments of peace and it was back to "business as usual." This short production is very well made, and I have found myself profoundly touched each time I've watched it, and driven to a place of prayer, longing for God's Kingdom rather than the fleeting kingdoms of men. There is such a stark contrast between the two. Towards the end of the video the background music is that great old hymn, "Leaning on the Everlasting Arms." It seems to represent the Lord's invitation to come to Him, all who are heavy laden. He is still the Prince of Peace in the midst of a world wracked by sin and sorrow. You can click this link to watch the video. Hopefully it will energize your appreciation for this greatest of all gifts, that "Christ Jesus came into the world to save sinners." And may it also stir you to pray with renewed vigor for the world around us. The greatest gift of all - our sin exchanged for God's GLORY! "Now there were in the same country shepherds living out in the fields, keeping watch over their flock by night. Then the angel said to them, 'Do not be afraid, for behold, I bring you good tidings of great joy which will be to all people. 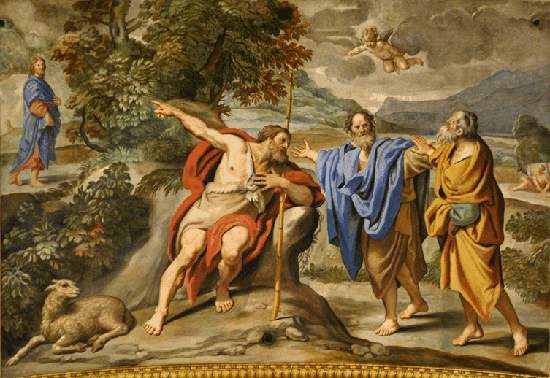 This is the amazing exchange: we give Him our sin, and our hearts, and He gives us forgiveness, acceptance as children of the Living God, and a new and eternal life! A old friend posted these thoughts from his even older friend called Pastor Bob. I thought it presents a very good perspective not only just for this season Christmas season but all the year long. And so I just want to share the blessing with you here. "From our human, earthly perspective we speak of 'Advent' - the coming of the Son of God to us. "Emmanuel" is the word of celebration sung by all of us who once 'sat in darkness longing to see the great Light' of Eternal Life coming down to us. "But from the heavenly perspective, in the Holy Spirit we may ponder the 'goings of God.' What is 'Advent' for us, is a season in time in which, to our human understanding of heavenly realities, 'the Beloved Son is away from home.' 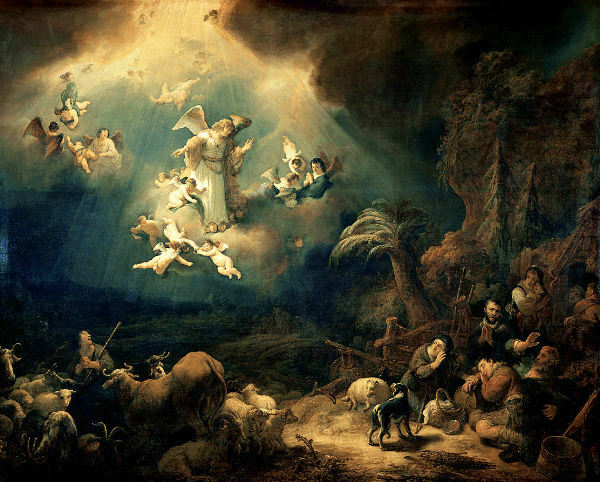 The Angels, giving 'Glory to God in the Highest,' followed their Lord in His 'descent' to the edges of our human experience, as His infant form was held in the hands of a humble carpenter and his virgin spouse. "Because God transcends the categorical borders of time and space of the human mind, there was no sadness in heaven at the event of our Lord's 'coming' to us. 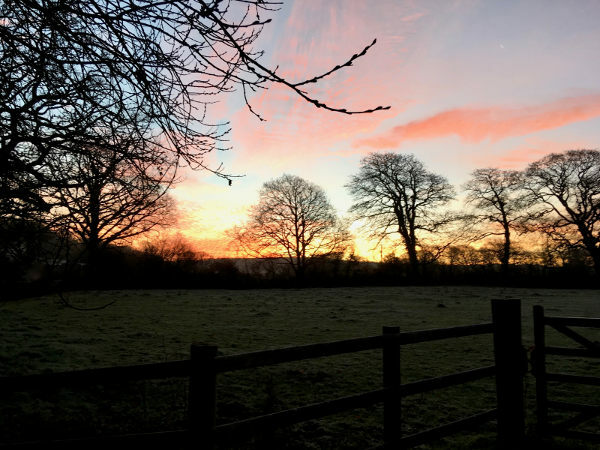 That coming was a glorious manifestation of the 'going' of God - reaching out to bring His wandering creation back into the Eternal Purpose of Unfailing Love. "Let us prayerfully stand by faith with the Angels and 'Saints in the Kingdom of Light' and join the praise of heaven for 'the goings of God.' This is the fullness of 'Advent.' "
Written by Pastor Bob Y. We pray the Lord bless you and your loved ones this Christmas, and also may the number of those loved ones grow because of 'the goings of God' through you! 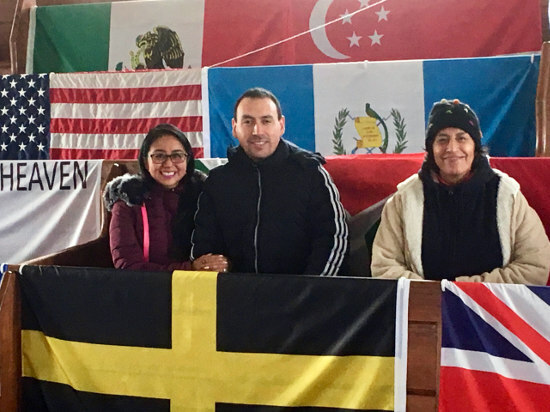 Last Sunday we said goodbye to our daughter Grace, and then on Tuesday picked up another young friend, Magdaly and her husband Sergio, from Quetzaltenango in highlands of Guatemala. We lived there for five years helping to establish a Verbo church, and her parents part of our group and special friends from the early days. Grace knew her older sister and her from the Sunday school and visits to play, so it would have been nice for them to see each other after 30 years! What a special blessing for us to get to know both her and her husband now as grown professionals and, more importantly, followers of Jesus! It was such a joy to experience, in person and real time, the truth of 1 Corinthians 15:58 that says, "Therefore, my beloved brethren, be steadfast, immovable, always abounding in the work of the Lord, knowing that your labor is not in vain in the Lord." Little could we have imagined so many years ago in Guatemala that we would ever be missionaries in Wales. 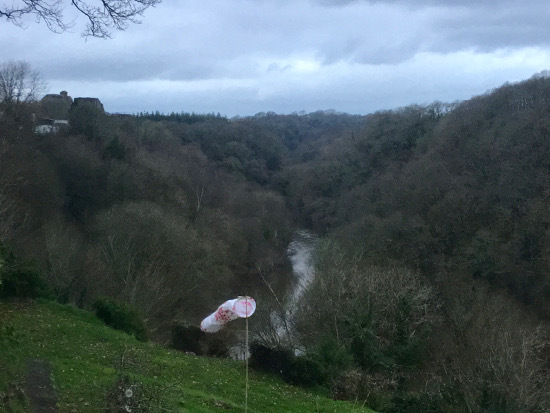 And less would it have occurred to us that one day, in the then distant future, someone from there would come to visit us all the way over here. And even less likely still would we have imagined that one the precious children of our congregation would even remember us or come for a visit. But, of course, God is true to his word and always has unexpected ways of surprising and blessing us as we follow his leadings. 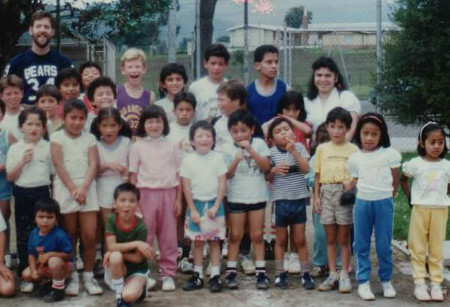 This photo was taken in 1989 of the school that we started in Xela, the indigenous name for Quetzaltenango. Magdaly is on the far right, perhaps distracted by thoughts of future and faraway places. So you can imagine the delight of having her and her husband with us for a few days at the end of their tour to Paris and London. It was wonderful to take them up to the chapel and spend some time in prayer there. It was then that the fruit of God's faithfulness from one generation to the next came into such a sweet focus as we blended hearts and voices to call on heaven's mercies to pour down on this land once again. We also had the privilege of showing them around some of the extremely beautiful places in our area. They even got to see a few hours of sunshine in the midst of a typical wet Welsh winter! One place that was particularly impressive was the Strumble Head Lighthouse near Fishguard. The wild winds shook the car and the great waves crashed time and time again into the cliffs, sending masses of white splash and spray skywards in stark contrast to the black rocks and dark grey clouds. It made a great picture of our prayers for God's kingdom to wash over this nation with His light and power. 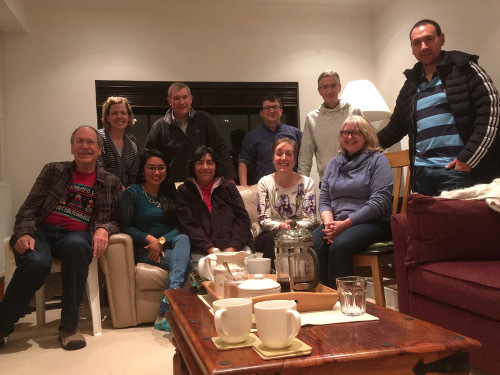 On Sergio and Magdaly's third and last night, we were invited to our friends Stan and Sue's house for a delicious supper, with worship and prayer following. With two other couples who we've become friends with over the years, there was a fair bit of translation going on, but we had a fabulous evening together. And an extra surprise for our dear visitors from Guatemala was a powerful time of prayer and prophecy over them that blessed and touched them deeply. It is such an amazing gift that we so frequently find ourselves enjoying the company of God's saints. And to have this special taste of old times and new blended together into the fold of the moment was heartwarming and glorious. And it is precisely this kind of experiencing the Body of Christ in action as "family" that demonstrates God's love and can welcome the lost and lonely into the newness and fullness of life we have in Jesus. As the world grows darker around us in our times, we can clearly see God preparing the nets across nations and generations to draw people into the eternal welcome of His grace and salvation.